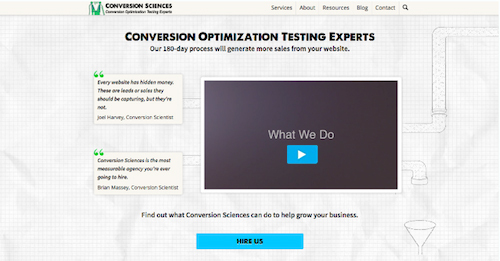 How professional the site looks – The version WITHOUT the human ‘authority’ picture was perceived as more professional. The mean score for professionalism is higher for all the No Picture sites, and significantly so for 3 of the eight sites. How modern the site looks – Inconclusive overall. Picture vs. no picture had less of an impact on the perception of modernity than the actual sites themselves. 3 out of 8 sites were significantly more modern with NO picture, but the pattern didn’t hold across sites as a whole. Client size? – The version WITHOUT the human ‘authority’ picture was perceived to have larger clients. 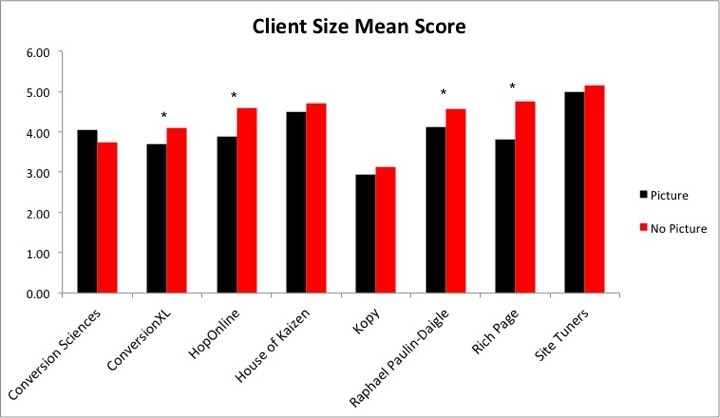 Version (Pic VS No Pic) and the website itself are significant factors in how respondents evaluated a website’s client size. Respondents perceived a website’s client size as significantly larger with the no picture version for four of the eight websites. 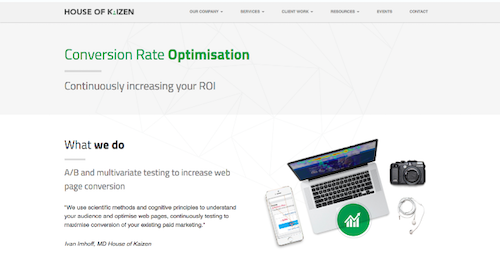 The direct lesson here is that a human image on the home page can impact general perceptions of the site (note that respondents are very likely not potential clients of the services presented – see limitations). More specifically, it can reduce the perceived professionalism and the size of the client that the service deals with. These findings likely are applicable as an agency moves towards larger clients, where ‘personal touch’ isn’t a selling point but rather a sense that the agency is at a necessary level of size and professionalism to be trusted. Past research shows that the implementation of a human image enhances: appeal, enjoyment, positive attitudes, social presence, and the overall emotional connection that consumers feel to an organization (Wanga, 2016; Cyr et. al., 2006). However, context is everything. We wanted to know how it translates to an angency website’s perceived professionalism, modernness, and client size. We explore these questions in this study. 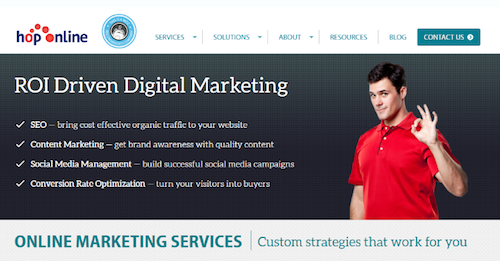 Original page – showed the homepages with a human image(s) representing an authority figure. Variation page – showed the homepages without a human image. In some cases we modified the page elements to adjust for change in appearance. We want to know how a company’s website homepage “look” can affect perceptions of how large of a company it is (how professional, how modern, & what type of clients). 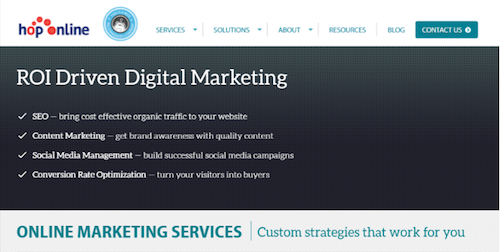 This survey will show website home pages of 8 businesses. For each one, view the homepage, and provide us with your feedback via the 3 questions provided. Next, participants viewed the eight agency pages. How professional does this page look to you? How modern does this page look to you? The scoring for all questions allowed us, for each question, to compare mean responses using a two-factor ANOVA without replication. We compared the version (with vs. without photo) among the sites, and within the websites themselves. 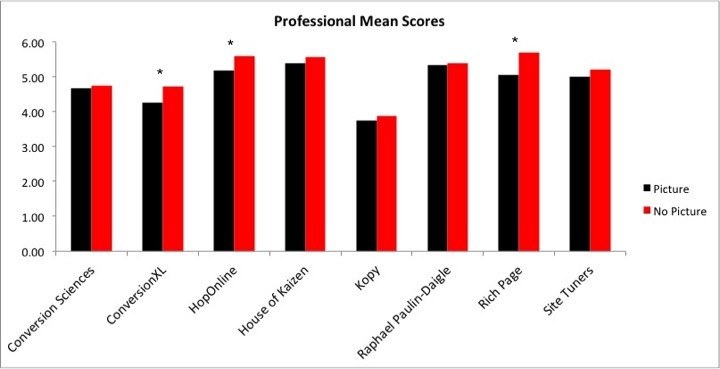 Result takeaway – In each of the eight websites, the mean score for professionalism is higher for the No Picture sites. For 3 of the 8 sites the difference in professional mean scores between the two site versions is statistically significant. The two-factor ANOVA test indicated there is significant difference in professional mean scores based on picture type and among the 8 sites. Mean scores for the professional question. 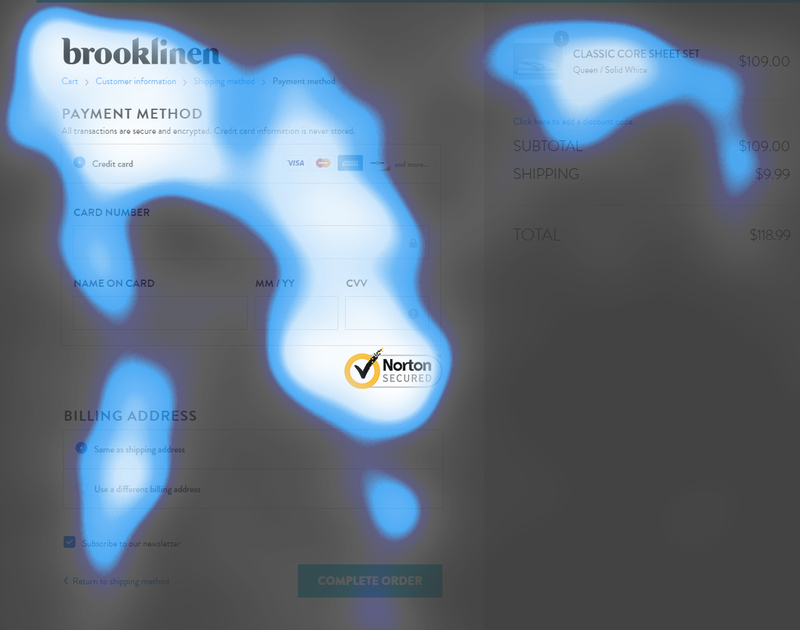 Gray highlighted box indicates higher of the two variations and the black box outline indicates a significant difference in means. Histogram of professional question mean response. Asterisk (*) indicates significance (at 95% confidence) difference between original and variation. Result takeaway – Comparing means of the two versions of the eight sites, the no picture version scored higher six out of eight times. Picture vs. no picture had less of an impact on the perception of modernity than the actual sites themselves. 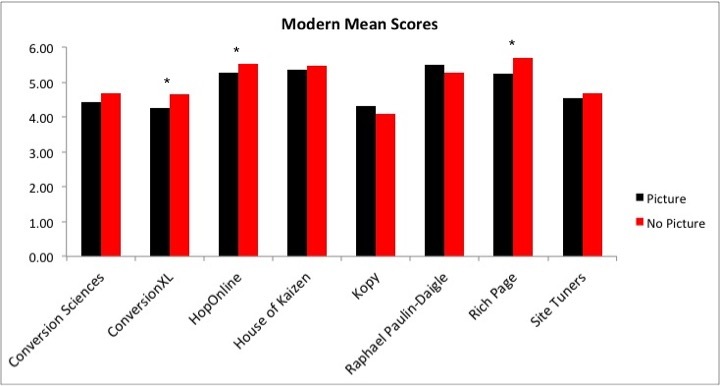 Mean scores for the modern question. Gray highlighted box indicates higher of the two variations and the black box outline indicates a significant difference in means. Histogram of modern question mean response. Asterisk (*) indicates significance (at 95% confidence) difference between original and variation. What type of clients do you think this company works with? 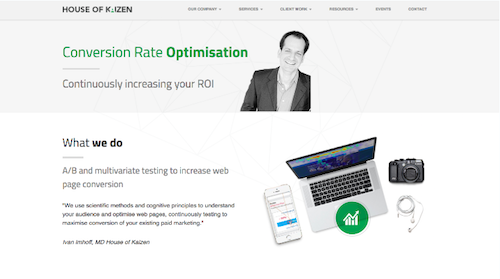 Result takeaway – Version and the website itself are significant factors in how respondents evaluated a website’s client size. Respondents perceived a website’s client size as significantly larger with the no picture version for four of the eight websites. Mean scores for the client size question. Gray highlighted box indicates higher of the two variations and the black box outline indicates a significant difference in means. Histogram of client size question mean response. Asterisk (*) indicates significance (at 95% confidence) difference between original and variation. The image itself might not have been the cause of the effect seen, rather, there might have been an increased sense of professionalism with less features on the page. Not every homepage labeled the founder picture as the company’s founder. Some participants probably didn’t make this connection, and instead perceived the picture as any person, maybe a customer/client, but not the organization’s founder. We surveyed a general population, not marketing professionals or business owners that would be more familiar with these type of sites. Thus conclusions here are restricted to general perceptions. The versions without the human ‘authority’ picture were perceived as more professional, and they were also perceived to work with larger clients. However, this didn’t take into account audience members who may be familiar with the founder from conferences, podcasts, webinars, etc., and therefore introduces the familiarity effect. Interesting conclusions, perception is everything! 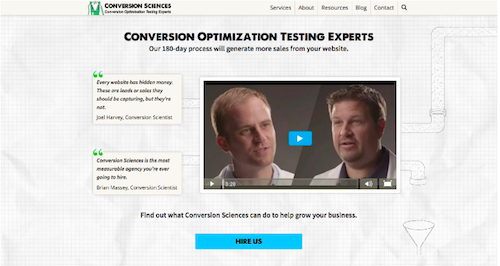 Surprised not to see http://www.conversion-rate-experts.com/ in the bunch though, not that it would have changed the outcome. Keep on the good work guys! Very interesting. I wonder if the perception that a website/company is more professional or works with bigger clients may come from the countless sites average consumers visit. Typically major corporations and brands where we rarely see an image of the founder or CEO on the homepage. (except for The Colonel KFC ;) So it would seem to me that on a subconscious level people are associating no founder image with bigger and better. Because that’s what they typically see. It is interesting that all your examples (pics above) feature young men (dressed rather casually, smiling, and standing in a rather relaxed way). I imagine those could also have been factors (gender, age, posture, facial expression and/or outfit). And don’t forget about the colour scheme. I think using a picture on the About page is still a good idea. That’s where people go to see who the company is and what they’re about – especially for smaller companies. Something to definitely test as it can vary company to company but I wouldn’t say no to adding a picture on the about us page because of a study about pictures of founders on a homepage. Besides, the experiment does have a few flaws…when the pictures of the founders are removed they’re not replaced with anything and are left as white space. Leaving these websites to look unfinished. I’d be curious to see how this experiment would have played out if they filled that whitespace with another placeholder picture or text. I’m completely shocked. From my experiments, founder/profile images increased conversions. I’m not sure if everyone else in the CRO space agrees, but images bring a personality people can relate to. No photo pages may increase the professionalism and “big shot” appearance of web/landing pages, but I’m very skeptical about them increasing conversion rates – which, at the end of the day, matters mostXL. Another question I would like to know is “are you be more likely to trust/buy from this company” – picture/no picture. I’m sure this is an obvious question for you guys. Maybe you’re holding out on the goods for a follow up case study? Interesting info. How does this correlate to consumer retail websites? (Fine jewelry in particular) Still hold true? On one hand showing the owner’s picture could build trust and transparency. But apparently it can also impact professionalism too. So which would convert better? In response to Alan’s comment… Sometimes I like working with smaller companies too, but I think that if you see someone famous (from a bigger company endorsing them) it actually makes you want to do business with them more. Hey Toby, yep. We’ve discussed this a bunch. Sometimes you don’t want to work with a ‘company’ but a person. This is especially true of smaller agencies run by well known people. But your suggestion of endorsement is a different subject. That is social proof, where we were looking at people not ‘endorsing’ a company/website, but someone being the ‘representative’ of it. Thanks for the comment, cheers! So what are you thoughts, considarations and internal discussions about Keeping the photo on the site or removing it? So I officially win the “Least Professional” Award right?? Fortunately that homepage still converts 13% and 14% every month despite being unprofessional (although being semi-unprofessional is part of my whole schtick, so it’s an asset in this case). Thanks for the interesting experiment Ben!! Great post! Love your in depth studies. how a users perception is impacted by showcasing the companies employees. Also, the difference between types of team pages. Ones that are more professional and those that show more personality.